Hi Nicola, I did the dressage rider training program in the Canadian winter and I only ride outdoors. So I had lots of time to concentrate on myself but no opportunity to ride the horse until Week 11 of the training. I am now riding again the biggest difference is being able to think about what each part of my body is doing and how it affects the horse. So I am bracing my belly, I am also bracing my glutes!! So I am learning to think about what can I relax in my body. This is making a huge difference to my horse and how soft we can be together. I also tried doing some yoga and the hindu stretch before my riding and this helps a lot. I am very strong but not very flexible so this helps a lot. Hi Nicola, I know that you have put so much into teaching all of us, I feel like you are my second trainer! Your encouraging words in each video are what keep me going, and moving forward in my quest to become a better dressage rider! But not just a better rider, a better person overall. I don’t think you know how much your advice about slowing down, taking time, being mindful and consequent really do matter to us all! I’m for one becoming a better person, wife, friend, everything! And I have you to thank, your caring and thoughtful presentations are so inspiring! I really like the format that you developed for DRT3. I like the intro to each video, what we should expect, what tools to gather together, and the snapshots of what the movements will be. I found it helpful to ‘gear’ up myself for the exercises and to know what to expect. I also like the attention you give to teaching us about our bodies, how they move, what the different parts do (cross-slings, fascia, how one body part affects the opposing one, etc.). I’m learning so much more than I thought I would when I first signed up over 2 years ago for DRT1! Also, I just read your email from today about our horse community, and I agree 100%! We are sometimes a bit crazy, but we love our horses more than anything and we will do anything to keep them happy. And the support we give each other is the best! Thanks for your comments regarding all of us born with the horse gene, we are one lucky group to have the horses as our best friends! Take care, and thanks again for helping all of us become the best we can be for our beloved horses. PS: Totally loved seeing Elly, Lucy, and Leo in the videos too!!!! And hoping you will do a DRT4 someday! I have only good things to say about DRT. I’ll begin with Nicola’s positive and inspiring attitude! Add to that the ever evolving 20 minute workouts that improve strength, flexibility and balance. to notice a difference as his attitude has been very positive and he is more forward and balanced. Thanks for all that you put into your program including the extra resources! I will definitely be signing up for DRT 2! Hi Nicola, I am just wrapping up DRT1, doing the last few exercises this week. 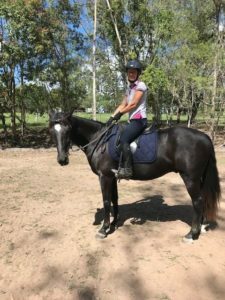 The program has helped me get much stronger which allows me to be more balanced and supple on the horse. Before, when things get difficult physically I found myself get stiff in an effort to be strong. While I have done yoga for quite a few years and found the yoga portion of the program easy, the strength exercises definitely complemented my existing exercise program. I now find that I am more able to solve problems while I ride and support my horse when he struggles. He has become more balanced when I am more balanced. I enjoy the variety of the work outs, it takes the guess work on what I should be working on. I just follow the routines (I do each one twice) and trust that my body will get worked in a comprehensive fashion. I still have areas where I struggle, in particular keeping my leg back, the heals down and the feet in the stirrups. I look forward to DRT2 and hope that I will progress further. 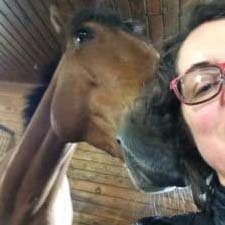 I am 58 years old and my horse is turning 21 soon. This program is helping us both stay fit. Honestly, I have never been this fit in my entire life. Looking forward to more DRT! Hi Nicola! Thank you so much for the program. I am doing the twelfth week now because I went to the Alps for one week and did only yoga there and after that I was really sick for on week and did nothing 😊 The program really doing well for my riding as well as for my bad arms and wrists. The yoga sessions is great and I do them several times a week. I sleep better and have fewer problems with restless legs when I go to bed (if I do some yoga exercise before bedtime). The balance is improving but I am not the best in class 😉. I really tried to stand on my knees on the swissball and succeeded for some moments. Haha did my day. Love to do de sessions three days a week. Perfect with 20 minutes. I use to end with some extra stretch. I will think about taking the next course as well. Love to have the program available for a long time because its good to go back and do the sessions again now and then. I finished DRT3 last week. Thank you so much for providing such a great program! I definitely found it MUCH harder than DRT1 or 2, and I think one of the biggest reasons is moving to the 60-second block for each exercise. It’s a difference that makes a difference 🙂 But it’s all wonderful, and I definitely plan to stay in the DRT family! 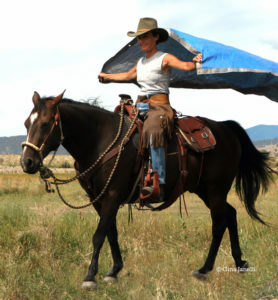 The combination of strength/balance/core/flexibility is fabulous for keeping me moving, on or off the horse. My birthday was this week in fact, and while I was tempted to sleep in I ultimately decided that it was more fitting to celebrate turning 51 by doing a DRT workout, thereby giving myself the best chance of being able to KEEP moving for years to come! Hi Nicola, Firstly thank you for creating such an interesting and diverse program! I loved the variety of all 3 programs and the many challenges along the way. What has been particularly useful for me was to see where I had a weakness at the start and by the end of the program it had improved. I still have a few challenges like my right glute med doesn’t fire up as well and my left hand to right foot isn’t as well coordinated in the table top exercise but I will continue to work on these areas by repeating the programs and doing other core strengthening work. What I have definitely benefited from is I can now work without stirrups in all gaits! Before DRT I never had the confidence to Canter without stirrups, now I love it!! 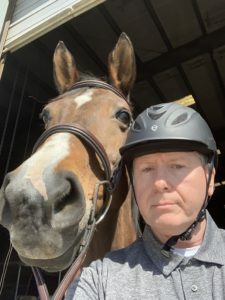 In fact I had a Rider Analysis session last Saturday from Russell Guire, Centaur Biomechanics coach and he said I was better without stirrups woohoo! 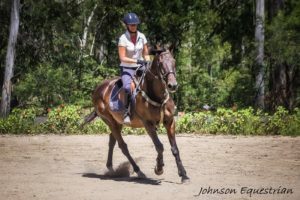 I really enjoyed DRT3 and was pleasantly surprised that it was more about improving fascia lines and suppleness as well as response times in the rider strength workouts. It was different to DRT 1&2 in that it was a summation of all the work previously done but at the same time challenged you in different ways eg using the strength and suppleness gained to be able to respond faster. The yoga workouts complemented the core and rider strength workouts perfectly. I look forward to hearing about any future DRT developments. All the very best to you Ben and the animals! Hi Nicola, I have completed DRT3, and I highly recommend it after DRT2. The educational piece about the Fascia, and improving it’s elasticity has made a big difference for my body awareness, and flexibility. Adding “speed” to the different exercises improved my balance, and helped me to be really present and focused. At times I was sweating, and my heart rate went up, in a good way! I did modify the jumping exercises due to my knee discomfort. Moving opposite body parts (left leg, right arm as an example) increased my awareness of coordination, and which side needs more practice. It also has an effect on the brain, creating new pathways which can lead to new perceptions, and believes what is possible. Overall the yoga mobility was my favorite one, combined with the wisdom you shared. Hi Nicola, thank you so much for your program. I work shift work and having something that I can access whenever I have a free moment is valuable. I do all sorts of combinations of the program depending on what life is throwing at me at the time, a quick soft one if I am in a hurry or 3 in a row if I have more time. I found it very useful to learn more about how my body works,(or doesn’t). Which side is stiff and what I can do to help it. I run a lot and get stiff and sore. 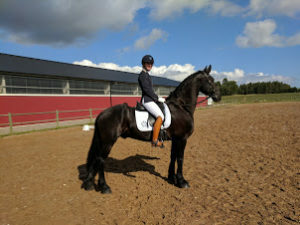 I have a very stiff side due to an injury which must effect the way I train my horse. Learning to relax some muscles while using others took a lot of my concentration, I tend to stiffen up everything to support the part of me I am trying to work. I am sure I must be doing this while riding, so learning to relax bits of me has helped my horse to listen to the bits that I want her to! Learning new ways of switching on my core I found very useful. All of the above, plus the strength and flex of your exercises, made me love the program! I compete a lot in Stockman’s Challenges and your program is certainly going to help my riding become more refined and precise. 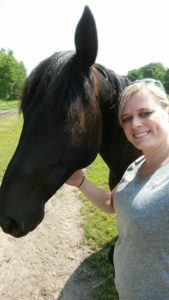 The photo is of me and my Quarter Horse Flirt, on a 20km canter training trail ride yesterday. I had your words in my brain and was putting them in to practise while zooming along. I live in the South East of South Australia and am pointing to NZ from the top of Mt Burr, a dormant volcano. Hi Nicola! I’ve really enjoyed this program…in fact I’m starting to repeat some weeks to build on what I’ve accomplished! I’m attaching a picture of the horse I’ve been riding in my weekly lessons since last Nov.Her name is Shi, she’s a 19 yr old American QH. I’ve been working on balance, posture, leg position and confidence. DRT has greatly improved my core and leg strength, my balance is so much better, I’ve become a more engaged rider! I’ve noticed a significant improvement in my hip flexibility and I find myself breathing through something particularly challenging rather than holding my breath! Yes, you can see a bitless bridle, Dressage saddle, western boots and jeans, hot mess!! 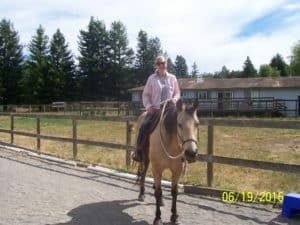 I typically trail ride in a western saddle! Thank you!!! I had a clinic over the last two days and had the most responsive and positive ride. I’ve been interested in riding biomechanics for some time and done a few Equi Pilates sessions. I’ve always been fit but decided I really needed to up the anti – maintaining good mobility flexibility and core strength is so important to my wellbeing! I turn 60 this year and its so easy to be complacent. I really knew I wasn’t getting a lot of biomechanics instructions because I didn’t have the actual core streangth! Getting fit to improve my riding has been very motivational!! I can now say to my 20year old Friesan welsh school master stay with me using my core and seat and he does! It’s a revelation!! 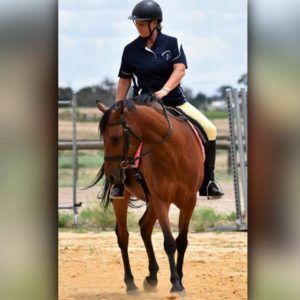 My fitness level has helped me maintain consistent energy and focus to get my horse over this slight impasse and my seat, balance flexibility have all improved my riding and as a consequence my horse is able to maintain her balance more effective and become more on the aids. We’ve got a long way to go but I can see a huge improvement and its making my riding so much more pleasurable and fun. Thanks again for really enjoyable program. I have worked out and played competitive sports my entire life. I found DRT a couple of years ago and incorporated some of the exercises Nicola recommended in her free videos into my exercise routine. Since I could see such improvement in my riding from just those, I decided to try the full program. I am so glad that I did! Until DRT, I have never found a program that I loved and helped me advance my riding so successfully. 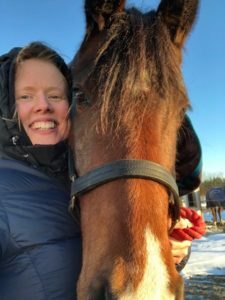 We have moved from Training Level to Second Level movements in just the 12 week span of this program…my horse was just waiting for me to get fit enough to over up. There are many things I love about the program…results being number one…but also many other things which make the program unique. The program addresses three areas of fitness that get progressively challenging each week. The variety of exercises challenge many of the same muscle groups in a different way each week which creates stronger, more dynamic movement. 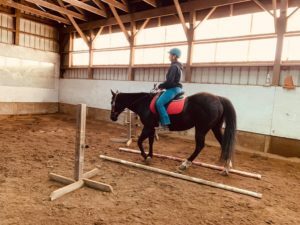 The program also incorporates exercises that perfectly mimic the skill set and motor development needed to be successful on your horse. Exercises that isolate and engage muscles while keeping the rest of your body stable and relaxed are exactly what we need for riding. I love the diary where one can log the workouts for a visual overview. The schedule is self-paced and very “doable” and flexible for even the busiest rider. Having access to the website and a ton of various workouts beyond the DRT 1 for six months is fabulous. The “homework” on the horse provides unique challenges that definitely improve our riding. 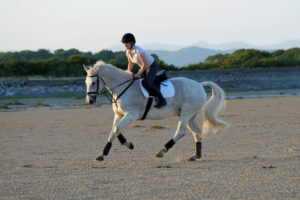 Even if one can not do all of the exercises and homework, you will see improvement in your fitness and riding. Nicola is so responsive and helpful with any questions or adaptations to exercises that you might need. I have arthritis in my wrists, hands, knees and shoulder. Some of the exercises were painful to begin but I persevered and now I have much better range of motion and strength and less pain in using those joints/muscles. If you love a challenge and you want to see your fitness and riding improve, this is the program for you! Hi Nicola, Woohoo, I completed week 12’s last session – Rider Strength – this morning. The program has been amazing and kept me motivated to continue on each week as I have really noticed a difference in my posture, balance and strength! 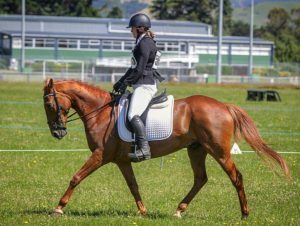 Flea, my 10yo Stockhorse Gelding (picture from today attached) seems to be respecting my leg aides a little more as my strength improves so it’s a win, win all around! Hey there! Finished DRT3. Sadly, wished it hadn’t ended. I am already starting over, repeating it again! Wasn’t sure what you could do different in DRT 3 that could top 1 & 2, but you pulled it off. 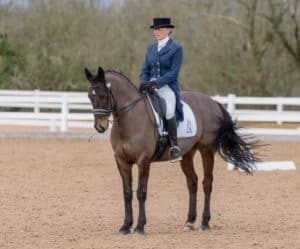 I can truly say that my crosslings and diagonals are stronger and this has improved my dressage balance and independent seat. My horse thanks you, too! And I can finally kneel on that crazy ball and do wood chops! Only thing I can say for me is that some of the core and strength workouts if the exercise was truly difficult by the fourth round I was dreading it. Can appreciate the need for the repetition though and for twenty minutes, I can get through it. Always look forward to having you on in my home everyday. Thank you! Thank you! I enjoyed the program as well as having the opportunity to share the experience with others around the world. The greatest benefits to me were in balance and stamina. I’d recommend the program to others regardless of riding discipline. I have just completed DRT 2 and loved every second of it. Nicola’s program has helped me to enhance my daily exercise routine, improving my strength and flexibility beyond my expectations. I took Nicola’s advice and tailored her routines to work for me. For example I’m a small person (BMI 18.5) and was diagnosed with osteopaenia a couple of weeks into DRT 1. Adding some weight and resistance training to my exercise program was advised, so DRT was perfect. I used 3kg dumb bells the first time through DRT 2 but am confident I can now progress to the recommended 4kg weights. As for my riding, I feel much stronger and more balanced in the saddle. My new mare is a big moving 6yo and the core strength I’ve gained from DRT 2 allows me to sit comfortably and allow her to really travel. If there’s a DRT 3, I’ll be up for it. Hi Nicola, I really enjoyed DRT1 and will be doing it all over again from the USB before tackling DRT 2. My instructor says my riding has definitely improved and my seat is 99% straight now. Thank you again for the program and your ongoing support. DRT has made my sweet girl Elle and I so much closer as we understand and communicate much better than we ever had due to my increased stability in the saddle and more independent aids. I love this program and plan to finish DRT 1 shortly as we were interrupted with a move to the country. Definitely looking forward to DRT 2. Thank you Nicola! Absolutely genius! 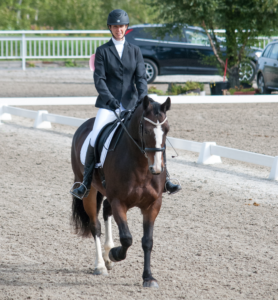 Hi Nicola, this program has helped me immensely with my riding! I used to constantly tilt off to one side but now I am more balanced and feel more secure in the saddle. It’s helped me relax and in turn helped my horse relax. Thank you so much for this great program! This is my favorite pic! I have enjoyed this program even though I had a setback. I have bad knees and I needed to adjust any exercise requiring being in all 4’s. However, most of the exercises were exactly like the ones I did in physical therapy, but 10 times better! As soon as Nicola related the movement to riding, I got it. Even the yoga ones. I hate yoga, but these yoga exercises made sense to me. My form was nothing like what she did, but after each 20 minute workout, my hips felt much looser. I noticed a change in my riding. My seat became an aid which improved my riding immediately. As for the setback, I hit a wall week 6. I talked with Nicola and decided to start with week 1 and have a do over. This time, each 20 minute workout was easier. I had developed strength and flexibility. I am back to week 5. My plan is to move forward. I am confident I will get to week 12. Jabba thinks so, too! Hello Nicola, I have thoroughly enjoyed the DRT1 and 2 programs. As an older rider who still wants to compete and ride successfully the DRT programs keep me fit and especially help maintain Core strength and flexibility . The three components of Core strength Yoga and rider strength and fitness keep you on track and can be easily revisited if you need to at anytime. There are also easier options available should some exercises be challenging. I wouldn’t be riding and competing with out it. Thanks so much Nicola for putting together such a great program. Hi Nicola, I’m really happy I followed the DRT program. I liked that there were different facets to the program, like yoga, core and strengthening exercises, homework, reading, videos etc. I felt stronger and fitter at the end, and it made a big difference in my riding. I definitely recommend this program. Thanks Nicola! 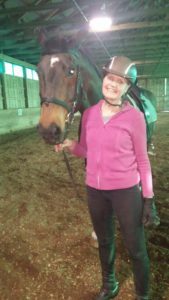 I am an adult onset rider and started the DRT program just to learn how to align my own body. It has helped me tremendously in learning how to use different parts of my body to communicate with my horse. The homework has also been very helpful for pushing me just enough outside of my comfort zone to learn something new without putting me in any kind of a dangerous situation. 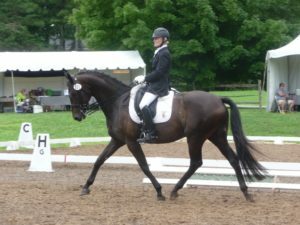 Though I don’t have any specific dressage goals I have found the program very helpful for my own personal growth as a rider. Hi Nicola, DRT3 is brilliant! DRT1 & 2 are great foundations. DRT3 is the crown. It has given me a better posture and I’m more at one with my horse. I have completed more or less. There is only week 12 rider strength to go. You see I postpone everything, it’s my weakness. However, it’s more to give me and I will repeat 2 or 3 times this year. Then it would be great to have a DRT4 to look forward to!!!! DRT3 is so well planned and gives so much and one would hardly need anything more, it’s just the psychological feeling to have a new next step to climb up, perhaps repackage into DRT4. You need to take a rest, go on holliday so you do not wear out!!! You are precious. 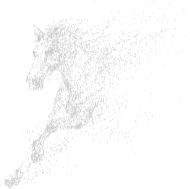 Hi Nicola, I absolutely loved DRT3 along with all of the dressage rider training programs you have created! When I am actively participating in one of these programs, I notice a difference in my strength and suppleness. 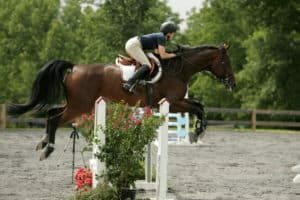 My riding jumps to the next level and I can focus more on my horse and precise communication rather than my own limitations. I would absolutely recommend the DRT programs to riders of all disciplines. Of the three programs, I have liked DRT3 the very best. I loved the timed reps with the clock visible on the screen because it really kept up my motivation. Thank you for all the hard work and research you put into the DRT programs and for another fantastic session! As an older rider with one horse to ride I need an ongoing exercise program to stay fit and flexible. I enjoyed the 12 weeks of new ideas and exercises. The combination of strength training and yoga stretching worked well. It was interesting to have exercises designed by someone who understands dressage and muscle use. I would recommend the program and am looking forward to part 2. I really liked the continuity with DRT1, and every time a program is finished, I long to start the next one, because these appointments with Nicola every 2 days are for me benchmarks of health and form, because I work all day sitting at a desk. In my daily life, I feel more supple and my abs is more tonic. 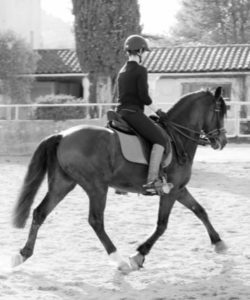 My horse has a trot with a lot of bounce and I find that now I am able to work a long time at sitting trot, which was very difficult before (I start training dressage tests for next month). And when he shows a little too much his joy and his youth, even when I’m surprised I always stay in the saddle … I gained balance! I feel that all three developed progressively very rationally, and DRT3 has definitely been the most challenging for me, mostly in terms of balance. Those are HARD!! A wonderful vision, beautifully implemented. Thank you! For the past almost 2 years I have started (almost) every day with you and Ben (the man behind the camera) and the cameo appearance of Elly. The DRT program has become a part of my daily life. I’m fitter, more balanced and, approaching 60, I feel better than I have ever felt. Your 5 minute jogs even got me running! No marathons, but I’m about to do my first 5k next weekend! I didn’t quite finish DRT3; I made it to week 9 and decided I needed to go back…I sometimes need more than a week to get the moves and keep up with the balance and strengthening work. . it that’s ok, this way I get to keep going and have weeks 10, 11 and 12 to look forward to mastering! I love the fascia work, to me that was the best part of DRT3. I believe it does make me more flexible and helps with my posture, seat and balance. Not to mention, I feel good once I’m done. It’s a great program. I never thought I’d stick with it for this long. So you’re doing something right!!! Keep it up and Thank You! 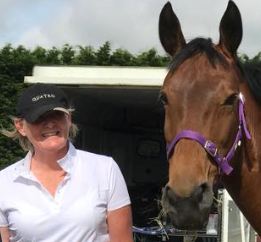 In late 2018 I started working on a fitness programme for my horse (Haken) and a fitness programme for me. For me, I signed up to DRT1 and I have absolutely loved it. I have felt a significant improvement in my strength, balance and mobility, and this has come from only 20 minutes a day of focused exercises that I can fit into my day when it suits my schedule. In addition to the exercise regime, I have read many of the articles that Nicola shares and I now have a better understanding of my muscle groups and how to address issues as they arise. 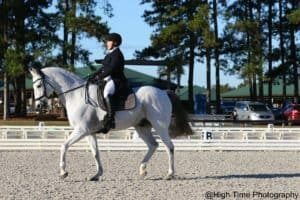 All of this has helped Haken and I make some significant advancements in our dressage results in the first three months of this year, and it has helped my balance and confidence when jumping. DRT is now part of my daily routine and I am looking forward to starting DRT2 shortly. 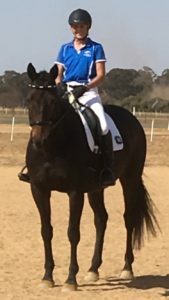 G’day Nicola, Attached is a photo of me on my 12 year old bay galloway Louie who I’ve been doing my DRT riding homework on. Before starting DRT 1 my sitting trot was non-existent. Initially when I would try the trot without stirrups, Louie would either speed up or slow right down but now I’m quite confident in the sitting trot and he’s happy to stay in the same tempo, even when I throw in a bit of rising trot without stirrups. I am so pleased with how much deeper my seat is after 12 weeks of DRT 1 and that means I feel much more secure and am able to focus on various parts of my body that may need work at any given moment. I also have better and longer workouts with Louie as I do not tire easily now. I am sure that Louie would thank you for your program if he could speak our language! I’m really looking forward to continuing with DRT 2. Hi Nicola, I can’t tell you how much I’m enjoying this program. I have signed up to many gyms, yoga, pilates etc through the years but nothing has clicked more than this. Although this photo doesn’t show too much – for me I love how upright I am and how in canter I’m able to keep my legs longer. (still room for improvement), but I am stoked. My big change is the lengthening and opening of my hips. I do the Hindu squat whilst I’m cleaning my teeth 🤣. There’s no question I’m fitter and at 59 years young I have much more stamina to ride for longer. I can’t recommend the program enough! It has helped me to develop my core in a way simply riding never quite could, and I have developed much more of an independent seat. I am feeling a much better rider and my horse is working absolutely beautifully too! Hi Nicola I have loved both DRT 1 &2. Have found it to be invaluable. From a core and stability perspective it has saved me on many occasions from hitting the dust. As I have a challenging mare who can do some unexpected shys and whoopies. These I might add are getting to be less and less I think she is starting to understand they aren’t getting her anywhere so she might just as well go with the flow ???? I love hearing the challenges and triumphs of all of the DRT members, it’s very inspiring and keeps me motivated. Thanks for your great program and I’m looking forward to DRT 3 in the not too distant future ???? I am just starting week 4 in my second journey through DRT1- finding it much easier this time round! Thanks to DRT I have already achieved my life’s ambition before I am 70 (20 months to go!) over 60% in the PSG – on a horse I have trained from scratch – where this photo was taken! Just under 62% to be precise! 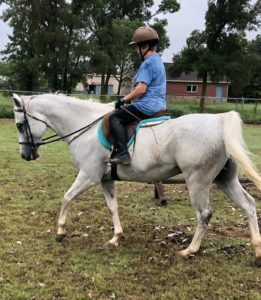 The programme has so helped my riding and general flexibility and strength – I wouldn’t have thought it possible at my great age! I can now do Hindu squats with no problem and have very nearly mastered kneeling up on the Swiss ball! 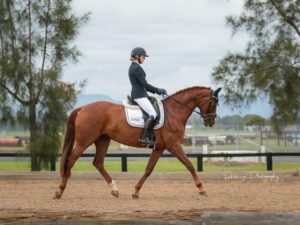 My horse Donizetti is also moving better and is much better in the contact without his rider wobbling around – you can see how happy he looks in the photo! I know it is a halt but in good balance and square so we must be doing something right as it was achieved from a collected canter straight on the centre line! Many thanks again for the brilliant programme and I am saving up to register for the DRT2 later in the year! Got to get even fitter for Inter 1 and maybe Inter 2 one day! This is the most amazing exercise program that I have ever done. I am 68 years old with chronic back and neck issues and arthritis and have noticed a significant reduction in my pain, more flexibility, and increased strength. I started seeing results within two weeks. Nicola is an exceptional teacher and I actually look forward to exercising, which has never happened before. 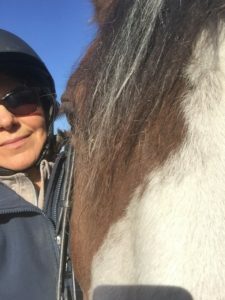 My riding has improved and my horses appreciate it very much. I strongly recommend this program to everyone whether you ride a horse or not. I will be signing up for DRT 2 and DRT 3! I’ve now completed the Dressage Rider Training Program & really enjoyed it. I used it to get back in the swing of things after recovering from a lengthy illness & it has been a great help. I’ve just completed a 3 day Dressage clinic in which my instructor noticed the improvement in my fitness. I loved the variety in the work & the ability to adjust the exercises to your own level plus they are short enough to be able to easily work it into a busy lifestyle. Many thanks Nicola for setting up these programs for those of us who don’t have time for a gym membership. Nicola, I can’t say enough positive things about your DRT 1 program. I’m an older rider, trying hard to move up the levels. I had never worked out before in my life, and while I found some of the workouts pretty challenging, I had no trouble keeping up, and at the end of the twelve weeks, I’m amazed and proud to say that I can kneel on the Swiss ball! I’ve lost 10 pounds, my flexibility is improved, and I can see a real change in my riding. I can sit my horse’s extended trot now! My horse and my trainer have both noticed the difference :). I have also really enjoyed being part of the Facebook group – it’s very supportive, and helpful on those days when I didn’t feel motivated. 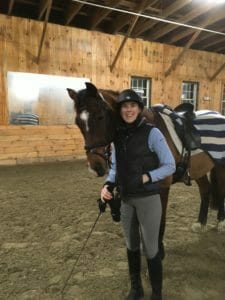 Honestly, it’s hard to believe that three 20 minute workouts a week (OK, I admit, I probably did more like 5 a week as the program progressed because I felt like I needed to repeat them and also because I grew to really like the yoga) has made such a huge difference in my fitness and my riding. It’s very easy to slot in 20 minutes a day, and the difference is so noticeable! I can’t wait to sign up for DRT 2! Thank you, thank you, thank you! 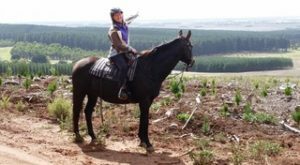 My relationship with my horse was my first motivation to undertake DRT 1. 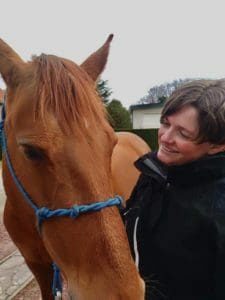 I wanted to become a better rider with a greater understanding and awareness of what goes on between me and my horse to enjoy our rides more and feel more connected in spirit to him. 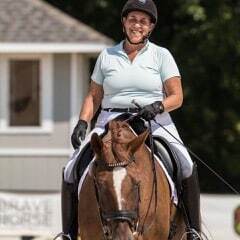 I train and lift weights, do cardio workouts, have taken Pilates and Essentrics classes, but nothing has helped and changed me so profoundly and quickly as Nicola’s Dressage Rider Training program. My fitness has improved, as has my balance. My legs act more independently and I feel lighter in the saddle. In other words, I’m more of a partner to my horse, not a hindrance anymore. At least, that’s what I feel he’s thinking : “Hey! She acts like she knows what she’s doing now. I can flow with her now!”. The beauty of the program is that I can go at my own pace and go back and forward as much as I need to. No pressure to perform, except what I put myself up to, even when it takes me out of my comfort zones, like kneeling on a Swiss ball! I feel a kinship to other participants in the program and enjoy reading their stories and contributions in our facebook group. I look forward to DRT 2 with great anticipation, as I know it will challenge me to get even better, without rushing me to do so. In the meantime, I redo DRT 1 and watch as I feel my horse relax with me and enjoy the ride of life itself. Thank you Nicola! You are a great inspiration and motivator. Each session is like taking a friend into my home. Thank you so much — this program was just what I needed, and it suited me perfectly in terms of the way it was structured and presented. Hi Nicola. Here is a photo of me and my horse Harry. We are not doing dressage at the moment, but I have done a bit in the past and hopefully one day in the future we will try our hand at it. I have achieved everything I wanted to and more out of this program. 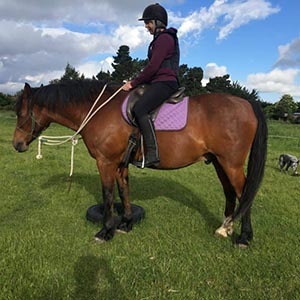 I came into it having had a few nasty falls and wanting to increase my stability and confidence in the saddle, and my riding posture is the best it has ever been now and it is effortless as my hips have slowly opened up leading to a lovely flat thigh and weight in my heels for the first time ever. No more trying to contort myself into the right position and then not being able to hold it. An unexpected bonus of the program has been that as my core strength improved I have had a huge reduction in lower back and sacroiliac joint pain, something I have lived with for years. Also I have fallen in love with yoga and do a yoga session every morning now to set me up for the day. My body is loving it. Thanks you so so much for this wonderful program. Since starting dressage rider training and with many hurdles and events along the way, I’ve lost 14kg so far. What’s more important though is the fact that I feel a lot stronger and more confident to tackle life. But above all, it taught me a body awareness that was part of what saved a life last year. Any program that can achieve such results, deserves a heartfelt thank you! In my free time I volunteer at the racetrack of Spa-Francorchamps as codriver of one of their medical cars. 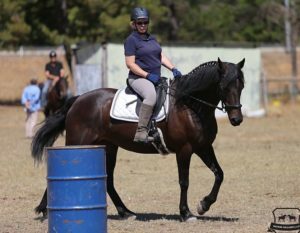 Horsemanship training gave me the mental awareness & DRT provided the strength and coordination it took to free an injured, trapped driver after a fiery crash in July ‘17. With so much going on at once, with all the noise, the flames, the smoke,… with thick firefighter gloves on and my eyes shut for most of it because they were unprotected, a lot of my senses were unavailable to me. Yet when looking at the incident footage afterwards, I did and noticed things in the chaos I still have no clue of how I managed them. One thing I do know: it wouldn’t have been possible without the skills I developed in my journey to become a better equestrian. The mental and physical training gave me a calm and presence of being, to use all the input available and make the right split-second decisions with a well-trained ‘autopilot’ brain and body. We are both extremely grateful to have survived that day. It’s made me even more determined to be as strong as I can be, to have and give as many chances as possible to see people go home to their families if I can help it any. I’ve struggled through last year with two pneumonias and then developed asthma from the smoke inhalation – it’s taught me to be kinder and more patient with myself, but also to never quit and keep pushing to get better. I am good enough, but I can also be better. ? It’s a bit of a contradiction of life I guess. So next time you are in that uncomfortable yoga position, or having difficulty to finish those last few reps with good form, maybe struggling to not get frustrated with yourself, consider this (I know I do): your ‘homework’ might one day save a life. That’s worth the time and effort, right? That’s positive energy in the making. As for the driver, he was seriously injured with many broken ribs and burns to face and arm. After a long time recovering and with permanent scars, he hesitated whether he’d be mentally able to return to racing, but decided to give it a go. And what a go it turned out to be! Together with the fab racing team that stood by him in his darkest hours, they won their class of the Spa 24h 2018, and went on to claim this year’s world title in the biggest GT endurance championship racing has to offer. Watching him on the podium felt awesome. He’s an absolute inspiration to me – never give in, never give up and give it all you’ve got. We don’t own life, but we do owe it. Love and take care of yourself and those around you, for that’s what truly gives meaning to our lives. The freshly finished Bootcamp just gave me an entirely new layer of fitness once again, and I look forward to adding many more in the future. Very grateful to all of you, and Nicola in particular, for the support, the resources and the motivation you’ve given and continue to give me! I learned a lot from the program. I have already been working on Nordic Track. The variety of Yoga stretches, exercises, and Aerobics makes a session more interesting. I am so glad I bought the flash drive of the program so it is easier to look at my computer. We went on a cruise to u a to celebrate our 49th Anniversary. I found the gym about half way through. Until then I figured I got extra work on our excursions because I had to let my husband lean on my shoulder about half the time. I know I held my own. Because the TSA lady at airport security had plenty of room for her hands to check inside my jeans on the patdown required since my artificial hip cannot go through the scanner. Nicola did great explanations and Ben’s follow up emails help a rider stay focused. I came home to one of my best jumping lessons since buying Silver Frost. Quit jumping in ‘94 because it quit being fun. Now I’m gearing up to do amateur eventing at 2 feet. At 76 I know I need work on balance. My instructor says I am better balanced and definitely stronger. I really enjoyed your program, so much in fact that I bought the thumb drive with all the weeks on it so I can continue to keep up with this program. I found the yoga to be very challenging and had to do a lot of the modified poses. But I loved the core and fitness parts and especially the “homework”. I also enjoyed the foam rolling info and the stability ball and balance work. All in all I think that this is an amazing program. You obviously spend a lot of time on trying to come up with progressive workouts geared toward the dressage rider. You always gave modifications which are super important for more “seasoned” riders like myself who may have limitations with our bodies. I definitely saw an improvement in my riding and my overall fitness in the gym. Thanks for a great program and I look forward to continuing it through the winter and beyond with my thumb drive. Be well and I look forward to hearing from you soon! I am sure that the program has strengthened my balance and my endurance, I am more comfortable, I extended my stirrups, and my aids are more effective! And it has become a very pleasant habit to have an appointment with Nicola 3 times a week, so I’m looking forward to the DRT2! 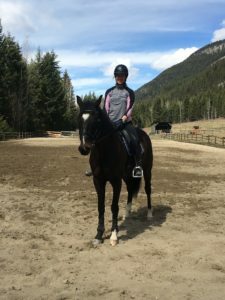 Dear Nicola, Having been mostly focused on my horses training for decades, I finally moved my focus on to my own training and that has been a major steep for reaching my goals. I have previously used high intensity fitness to stay in shape and build muscle tone for some years. 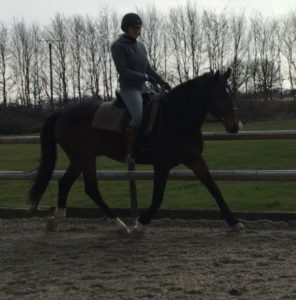 Not really knowing how to gain the balance I needed for dressage and avoid using my strong arms and legs to ride. I started searching for new ways. Nicolas program promised me that and I went into it 100% committed. After finishing drt1 I followed up with drt2 and I must say that it’s not my newfound core strengths that impressed me the most, it’s my new found body awareness that has been the biggest surprise and most useful in my riding. I feel my balance now and I’m therefore able to correct it in the saddle. I’m now able to feel the horses movement, cause there is much less ‘noise’ in my riding. I’m far from perfect and I will never be perfect and that’s perfectly ok. I’m improving and Im moving forward, that is for me mentally a much more positive state to be in. Riding has to be fun and every day I will remind my self to be thankful, be conscious and consistent, but definitely not striving for perfection. The structure of the program has been super easy to follow and adapt into busy family life, I love the massive amount of great healthy recipes and many many fitness videos to pick and choose from, all of them with a happy energized Nicola In. Nicola has delivered much more than she promised me when I signed up in the beginning. I will stick with her for many years to come. ? Thank you, Nicola, for DRT1 and DRT2! I just worked with a new trainer for the first time and he was amazed how straight I am. 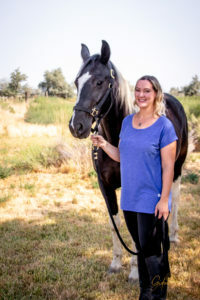 Your program has been part of what has provided me improved body awareness and equine focused strengthening and flexibility that has contributed to my straightness on my horse. I found that the exercise intensity level in DRT2 was right for my level of fitness, because I was already doing daily bootcamp, HIIT, yoga, or Pilates training. I loved how you emphasized very familiar ways but with new ways of thinking of them for the equestrian. I found the homework for DRT1 more directly useful than that in DRT2, and love that you remind us to repeat what helps us the most. 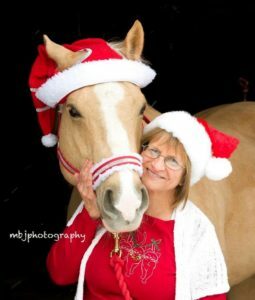 I do not have a new photo of me and my horse but am looking forward to new challenges now that we have found a better place for her and me to move on. Thank you for a thoughtful and challenging program that supports a jumping rider and benefits my horse. It is not just for dressage riders, for sure!